Aside from that, though, I had not read any other Helen Lester books, so when I was setting up the picture books for my new branch library that just opened recently, I made a point of picking up a few of her other titles to get a sense of what her writing is really like. Specifically, I read Tacky the Penguin, Me First, and Listen, Buddy. I am pleased (and relieved) to be able to say that Lester's other books convey much more positive and empowering messages than the one I took away from Wodney Wat, and I was impressed particularly by the way she so colorfully and accurately portrays the kind of phases and difficulties kids go through during their elementary school years. I was not at all surprised to learn that her inspiration comes from years of teaching school. Her characters are too realistic not to have basis in reality. Tacky the Penguin is different from all the other penguins. Most penguins march in straight lines and blend together in their black and white tuxedos, but Tacky wears a shirt with a loud tropical print, and his marching is much more boisterous, and much less orderly than his companions'. The other penguins don't know what to make of Tacky. However, when three hunting bears threaten the safety of the penguins' home, it is Tacky's out-of-the-box thinking that saves the day. To my mind, this book has the opposite message from Wodney Wat. Wodney prevailed in his story by bullying the bully. Tacky prevails by remaining true to himself. Me First is the story of a little pig boy named Pinkerton who insists on being the very first one to do everything. I became concerned from the beginning of the story that we were going to see Pinkerton punished and banished for his bad behavior, as we do with Camilla Capybara in the Wodney Wat story. Pinkerton is first to respond when he hears the question, "Who would care for a sandwich?" and a Sand Witch appears, insisting that the young pig has now volunteered to do her bidding. I worried this would be the end of Pinkerton. Instead, though, his time with the Sand Witch serves as a short penance, and he is eventually sent back out into the world to avoid being pushy and to sin no more. While I thought the digression into fantasy was weird, and the sandwich/sand witch situation was the kind of silliness I could never abide, even as a child, I think there are many kindergarten and first grade students in the world who would love it. And the message, that being first isn't always best, comes through loud and clear and without trauma. And finally, Listen Buddy is about a rabbit whose huge ears do nothing to help him listen. Whatever his parents ask him to do, Buddy does something close, but not quite right. When asked for a pen, he provides a hen. When instructed to bring bread, he brings a bed. When Buddy is sent out on his first "long hop" alone in the woods, his poor listening skills send him on the wrong path. He ends up at the cave of the Scruffy Varmint, who is pretty intent on eating bunnies who don't listen to their parents. Suddenly, when forced to fear for his life, Buddy can hear everything loud and clear. I was confused in the early part of the book, because it seemed like Buddy was just hard of hearing, but I guess his silly mistakes were just meant to be funny, and did not indicate that he couldn't hear the specific words being spoken. As in Me First, I wasn't crazy about the strange outside influence being the catalyst for Buddy's changes, but that seems to be a formula that works for Helen Lester, and I prefer these strange moments of grace brought about by strangers over the suggestion that the way to beat a bully is to join her. 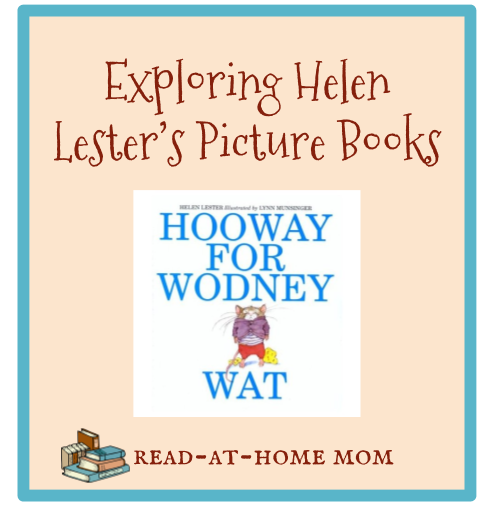 Overall, I think these four picture books - Hooway for Wodney Wat, and the three others I just reviewed - are best suited to classrooms where these particular issues are taking place. They are useful moral tales that are fun rather than preachy. I just think that sometimes the moral is lost, or misinterpreted, and the story suffers. Also, just a shout-out to illustrator Lynn Munsinger, who does a great job of creating warm, fun, and sympathetic images of these sometimes not very sympathetic animal characters. The illustrations are wonderful, and do a great job of depicting preschool and early elementary school life. For more on Helen Lester, visit http://www.helenlester.com.